Allyson Gofton has been cooking for New Zealanders for over 20 years. 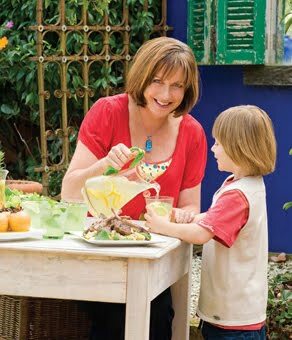 During her varied career she has assisted Graham Kerr both here and abroad, and became the Chief Executive Officer of the New Zealand Nutrition Foundation. She was also Food Editor for Next magazine for many years and of course we all feel we know her because for several years she appeared nightly on our screens as presenter for Food In a Minute. 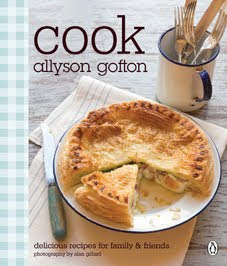 Allyson has written 19 cookbooks, including the best-selling Bake and After Work Cookbook. Allyson is a working mum with two young children and a very busy husband who love her home baking. We all love having family and friends round to enjoy a meal, and in her latest book, COOK, she makes it easy for us by sharing over 130 of her favourite recipes for entertaining at home. With chapters on barbecues, picnics, afternoon teas, mid-winter meals and more, you can prepare a sumptuous feast for loved ones without spending hours at the stove and breaking your budget. There is also an especially helpful chapter on large gatherings, with useful tips on getting organised, preparing a menu and how much food and drink to allow for each guest. Ity is worth owning the book for this chapetr alone. With beautiful photography by Alan Gillard, COOK is a treasure trove of favourite recipes. The recipe I selected first up was from the mid winter warmers section, slightly out of season, but it still went down a treat, it was delicious, full of flavour, and not difficult to prepare - greek lamb stew. The publishers have given me permission to reproduce the recipe here for readers of Beatties Book Blog. And a separate recipe for the whole baked tomatoes follows the main recipe. Preheat the oven to 160 ºC. If the chops are large, cut them lengthwise in half. Brown the lamb shoulder chops on both sides in the oil in a large, hot frying-pan. Transfer to a shallow ovenproof dish. 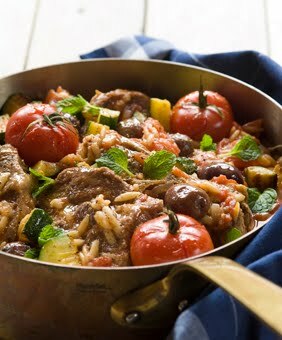 Scatter over the orzo, onions, courgettes, tomatoes and garlic. Pour over the stock and wine and season with salt and pepper. Cover and cook in the preheated oven for 50 minutes or until the lamb is tender. Add the whole-baked tomatoes for the last 10–15 minutes of cooking time. Sprinkle over the olives and mint. Serve in deep plates or shallow bowls accompanied with whole baked tomatoes and crusty bread. · Add 1 tablespoon of chopped anchovies. · Finish with a handful or two of fresh oregano or marjoram leaves. · Drizzle the finished dish with a little balsamic vinegar before serving. · Use lamb rump or topside steaks. · Use boneless chicken thigh portions, cut in half, in place of the lamb. · Use red wine in place of white wine. · Add extra flavour by using flavoured canned tomatoes. · For a more intense garlic flavour, chop the garlic and add with the onion – the finer the garlic is chopped or mashed the more intense the flavour will be. · Orzo pasta is also known as risoni. It is a small, rice-shaped pasta. Different brands on the market have a different level of absorbency. As a result, should your stew be too thick, add about ½ cup extra chicken stock or white wine before serving, reheating the stew if required. If the tomatoes are on the vine, cut them into individual tomatoes and leave the calyx on. Make 4 shallow short cuts from the calyx or centre of the tomato, like a cross. 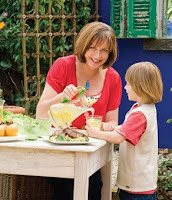 These two recipes are an extract from Cook by Allyson Gofton with photography by Alan Gillard. Published by Penguin Group (NZ). RRP $45.00. Available at booksellers nationwide. Copyright © Allyson Gofton, 2009. I've made a not so subtle request to Hubby about this book appearing under the tree for Christmas!